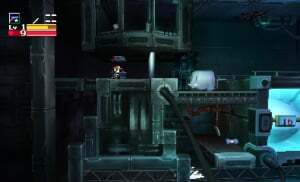 When Cave Story was first released for the PC in 2004, players quickly fell in love with its simple visual design and action-packed gameplay. And while the game has generally retained that look and feel for its subsequent multiplatform releases in recent years, Nicalis decided to put the 3D capabilities of Nintendo's new handheld to good use and gave the title a complete visual makeover from top to bottom. And unlike some remakes that end up losing much of their original charm during the transition, Cave Story 3D just got better. From a gameplay standpoint, not much has changed in the transition to the 3DS. You'll still spend the majority of your time traversing its many areas, shooting your way through the constant barrage of enemies and avoiding the ever-increasing number of hazards that carefully placed throughout the world. As you progress, you'll pick up more powerful weapons and gain abilities that allow you to face the tougher areas and bosses. It's this exploration and upgrading that give the experience its engaging feel, and the combination will keep you coming back for more. 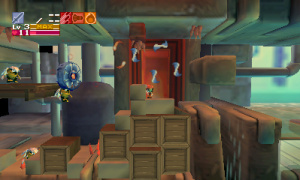 There are three basic modes of play in Cave Story 3D. Story is the main one and features the complete revamp of 3D visuals, including all of the backgrounds, characters, items and enemies. This mode plays out exactly like the previous WiiWare and DSiWare releases in terms of content, albeit with beautiful new visuals overlaid on top of it all. Classic Mode still features the same 3D backdrops, but this switches out all of the characters, items and enemies with their old-school 2D pixelated counterparts. While it makes a nice touch for long-time fans, the affected objects look a bit odd when presented inside the lush 3D surroundings. 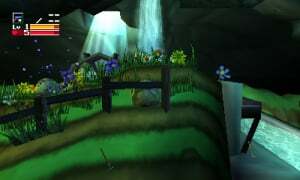 And for those who are able to beat a rather tricky area of the game, a unique Time Attack mode of that area will unlock for players to go back and attempt speed runs. It would have been nice to have had some new content ala Cave Story+, but it's a small gripe considering how great the original game still is. While the feel of the controls is a bit different at times, given that you're navigating 3D platforms this time around, the overall scheme still works just like it always has. There's still plenty of intense platforming and shooting, but you won't truly appreciate the manic gameplay until you get a ways in and locate some of the more enjoyable weapon and skill upgrades. Once you do, you'll find that manoeuvring works every bit as well as it always has and, when combined with the beautiful new scenery, it makes for one intense experience. There are really no words to describe just how gorgeous the 3D visuals look in Cave Story 3D. Not only is there an astounding degree of detail throughout the various areas, but the dark backdrops and carefully-placed lighting effects do an amazing job of revitalising the underground universe. And when you toss in the depth that the 3D brings to the table, you'll experience the world around you in a way that just isn't possible on any other platform. There's honestly not one single section that doesn't spring to life onscreen and show a side of the game that fans have never experienced before. Not to be outdone by the visual makeover, the soundtrack has also received a rather substantial upgrade, with every track given an extensive remix courtesy of Super Meat Boy music man Danny Baranowsky and Dustin Kulwicki. And while there's no denying that some diehard fans are likely to wince at the thought of anyone toying with the amazing original score, it's difficult to deny the infectious charm these new variations all feature. As much as the updated visuals add to the overall presentation, the modern soundtrack is equally up to the task. 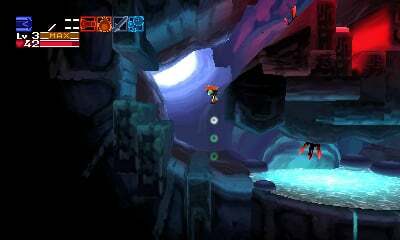 Cave Story has always been an extremely charming and engaging experience, but never before has the game come alive with the type of depth and realism that the 3D visuals and lighting effects provide. When you couple all of this together with the classic high-quality platforming and shooting action of the original, not to mention an amazing remixed soundtrack, you end up with what has to be one of the most impressive video game remakes we've seen in recent years and a title you absolutely should not miss. Definitely picking this up, great review! How early did you guys get your copy? Wow, that good huh? I guess I better add this to my already long list of holiday games to buy. Great review Corbs! I've had it about a week. What kept it from a 10 this time? I'm still iffy on getting this one. On one hand, I love Cave Story and I'm always willing to play it again. On the other, there seems to be absolutely no significant additional content added to this iteration and I'll be paying $40 for what amounts to a game that I can already play on-the-go. Glad the graphics aren't horrid, the opposite in fact. I think there is some new content in there though, such as never-before-seen beta elements from the original (music and may a couple new enemies), Prinny as an unlockable character, and the Wind Fortress level not included in any other Nintendo release. Can you confirm or deny this info? How does this feel with the Circle Pad? @Spookybif Nicalis probably sent them a "review copy" so they can get the review out before it's released. Sounds great hopefully I'll get it before or after my Birthday. Circle Pad and D-Pad both work well. Circle Pad makes it easier to run and shoot upwards, but it doesn't work as well for the pinpoint platforming sections. So about like it works on every other game where both are available for use. Didn't expect any reviews for this pre-release so this is a nice surprise. I am interested in this but I definitely cannot afford straight away. I might pick it up in early January. I will probably get this. Need at least one platformer after all. But I will be a little miffed when no doubt this retails for the full price of other 3DS titles. I shouldn't complain though I guess, I bought Ocarina and SFIV as well.... although SFIV was like half price. I've already preordered this. Glad to know that this is a sound investment, gaming-wise. Can't wait to play this amazing game...IN 3D! Was gettin this cause its the only game out to play in the beginning of the month till SML comes out later! Preorder my copy and can't wait to play it. Great Review! Nice review, not sure if I will pick this up though. never really played a cave story game. but im guessing that its some kind of darker mario title with a new cast, setting, and a level-up system. whatever, most side-scrollers all feel the same. im probobly wrong about this game though. @Corbs Do you guys plan to have a Pokemon Rumble Blast review up soon? I'm kind of still on the fence with that one. It's nice that Cave Story got such a great score. By the way how's the game in 2D for this particular version? Yeah, the review copy of Pokemon Rumble Blast is on its way to Phil for review. He's pretty fast with the turnaround. As far as the 2D sprites for the characters, items, and enemies, they're nice, but they just look out of place when combined with the beautiful 3D backdrops. Maybe that's just me, though. @Corbs I don't mean to bother you, but in case you didn't see my question (it was a little buried in my comment), I was wondering if you could confirm or deny any of the following content being in the game: never-before-seen beta elements from the original (music and maybe a couple new rooms), Prinny as an unlockable character, and the Wind Fortress level not included in any other Nintendo release. Can't wait to play this one in 3D! I can't tell you about any secret characters, but I can tell you that the stuff in Cave Story + isn't in this game, including the Wind Fortress. @HyperBMan Are you sure you can unlock her that way in the DSiWare version? I've gotten the best ending and I haven't been able to play as her. Regardless, good thing the best ending is its own reward because stupid Curly Mode would be an insulting prize. @Corbs Aw, shame about the Wind Fortress. Guess I'll have to buy Cave Story+ once it comes out on Steam, then. Good to know. Im STILL waiting for this to come out in the UK on DSiWare. Any news on a release date for that ? I think I'll wait on this one. There are just way too many new, original games coming out this holiday season and my funds are too limited for another iteration of Cave Story right now. It looks nice though and I'll have fun playing it when the price drops a bit. So what NEW stuff is in this, aside a fresh coat of paint, music, and refined time attack system? i love Cave Story, loved it on DsiWare, but I'm not spending $40 if that's all it offers, especially considering I can already play the original on my 3DS right now. I might consider it at $20, but even that's pushing it. "By beating time attack quick enough you can change the character and song played on the title screen. Under 6 minutes - character: Curly Brace; song: Running Hell" i imgaine you have to unlock curly by beating time attack in that ammount of time and since to get time attack you need the best ending you do need to get the best ending to get her. Oh my god.... MUST GET!!! (Pulls out Christmas list) no but really glad it turned out so great. This isn't worth the extra $28 over the WiiWare version for me. It also appears that this new graphical style will sometimes make it difficult to tell what is and isn't a platform. Isn't worth the extra over the free version for me. So, what did they add (besides the updated visuals and soundtrack), to make this game worth $40? Since Cave Story (in my opinion) is pretty short. No new area content at 3~4times the price= no sale. Simple as. No wonder NiS were worried about sales if they weren't going to add anything new for us to play with. No time attack doesn't count. Great game but too expensive considering how much previous versions cost, (or didn't cost). Never played it in any form so cannot wait, November is a sweet month for games across all formats!! Dang it, November will be an expensive month. Brilliant for the 3DS , but not for me. Looks beautiful though. I'll be picking this one up, but not straight away. Cave Story is a great game, for sure, but at this point i've played through it too many times (by which I mean, uh, twice) for this to be an insta-buy. Still, this remake looks real nice though! I have the original, (for DSiWare) should I buy this for $40 ($30?) Dollars or rent from gamefly? Rent. It's the same game but it looks different. I will be buying it used in 2 years. and the pc version twice too. its an excellent game, the best eshop title i bought including gameboy remakes and 3d classics. the BEST. the 3ds version goes in my priority list for sure, but not for now. I was going to skip this. great review, I'm definitely getting it now. This game seems like a great fit for me. I'm stuck in a part early on in the WiiWare version, and I think if I were able to take it on the road and try at it when I had spare moments on the train, I'd have much more patience than I do when sitting still in front of the television. Great review, Corbs. I'm going to buy it, and boo to those that don't. The game has received a graphical redesign. Not a touch-up or better filter like some of the other 3DS ports. I mean, look at that lighting and beauty. I'm going to buy it. Because of the other releases coming out at a similar time, it may be pushed back to a Christmas present. But it will get a purchase from me this holiday season. And, Curly? This time... I'm fixing my mistake! Wait for me! I'll definitely get it at some point but not near release and even though I've never played it before the lack of new content is still putting me off getting it at full price. Awesome review, Corbs! I can't wait to play this next month! I'll definitely pick this one up.. In due time. With Super Mario 3D Land and Zelda Skyward Sword coming in November and on the same day I don't really have the time nor money to buy this. I'll just wait until next year and pick it up together with Resident Evil Revelations in the end of January. Have the wiiware version and it's a most certainly interesting and challenging title albeit short. Not really interested in buying @$40. Might pick it up when it hit's $20 or less. Don't complain that the game is short... I had to play through it at least 3 times. I think it was 4. I don't do that often. Have you actually seen everything in the game? Gotten all the weapons? Beat the REAL final boss? Seen the best ending? Found all the easter eggs? For those who are having second thoughts on buying this, Just understand that you could sell this game & get the majority of your money back within a month of purchasing. I wouldn't be too skeptical on this. I have it on preorder as well as a few others for the end of the year. I trust these reviews & more importantly I understand why Nintendo has so many titles being republished. The investors are holding portable market hostage. That is important for all the critics on here to understand why 3ds doesn't have many new titles. Investors are NOT convinced that new 3ds original 3ds games will sell. That is why you see so many proven franchises return. Keep that in mind when you say "Why is nintendo releasing this again" There is NO choice for now. That is why we might as well get use to the ports for a while. Ports and remakes are fine when they've been previously unavailable to me (SSFIV and BlazBlue) or have enough new content to justify another purchase (StarFox), but now that I know what this version includes (or lack thereof), I'm now going to spend just $12 on the WiiWare version instead, plus I get to play on a much bigger screen. (Portability? So what? All other things being equal, I much prefer console versions that I can play on a TV screen instead of dinky handheld screens.) If you're wondering why I don't just play the free PC version, the easy difficulty setting on the WiiWare version is worth the $12 for me. Well. 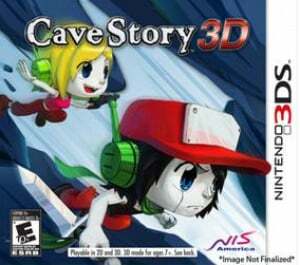 I want to get this game, if not only to support the amazing person behind it, Pixel, but it doesn't have anything over Cave Story which I already have on my 3DS. I'm glad I'm in the minority when I say I'm actually have to disagree with this. For me, the 3D models have almost completely stripped the game of its charm. It looks so...so CHEAP now. The character models are lifeless and stagnant. And does anyone else think the game is just too dang dark now? Not thematically, just flat-out hard to see, even on the highest brightness setting. And the music...it sounds like it's trying too hard. It's too peppy, lacking that glaze of melancholia that the original exuded ; now there's this cheesy 90's Sonic vibe to the tunes that just sounds wrong. Of course the game is still fun, because the gameplay is thankfully untouched. So far though, I really wish I wouldn't have sunk $40 into this when I could play the best version of it for free. WHAT A RIP OFF! ITS THE SAME THING AS THE 10.00 DSI WARE VERSION BUT 3D. I found a new copy today at Toys R Us!! It's a hard game to find at MSRP, I had to buy it just for the rarity and chance to own Cave Story with improved 3D graphics. I'm really interested in getting this! Been looking for this one for a long time, never saw this one in a store here and online the prices were sky high due to how rare it its in Western Europe. Today I walked into a shop just casually strolling around, and saw this one just standing there for €6,99. Lucky me.